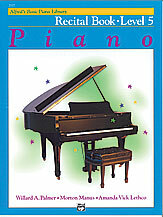 Alfred Recital Books congratulate students for a job well done by providing correlated repertoire to their Lesson Books that are based on concepts they've already learned. As a result, the pieces are quickly mastered. Recital Book Level 5 contains many original pieces of standard literature, including Beethoven's Sonatina in G, Chopin's Prelude in A Major, and originals by Kohler, Gurlitt and Clementi.